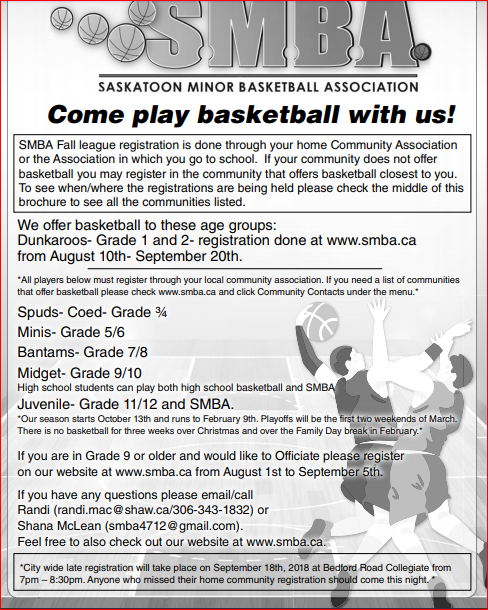 Updated Wednesday September 19, 2018 by Saskatoon Minor Basketball. The 2018/2019 Fall season starts on October 13th and goes until December 15th when we break for Christmas. The season resumes January 12th and runs until February where we take a two weekend break over the school Family Day week off. We resume for playoffs for the first three weeks of March. Fall League games are on Saturdays at various high schools in the city and the league traditionally starts the Saturday following the Thanksgiving weekend. All teams are formed by the Community Associations in the city and they set the practice times as well. The SMBA does not form teams or set practice times. If you miss your community registration please come to the Late Registration night at Bedford Road on Tuesday Septmeber 18th at 7pm until 8:30pm. Coming to this registration does not guarantee a spot on your home communities team as they may be filled up by this point. If teams are full you will be placed with a team that does have room. The Community Basketball Coordinator list is posted Here. Spuds and Dunkaroos players all receive medals after their last game in February. Playoffs are normally held during the month of March. Dunkaroo's Basketball: is a development program based on the sport of basketball for boys and girls (co-ed) who are in GRADE ONE OR GRADE TWO. The players have one hour a week for 12 to 14 weeks in developing basketball skills in a fun atmosphere. See information HERE. Dunkaroos registrations are all done on-line, on our website (Dunkaroos registration cannot be accessed through any community association online or in person). Spud Basketball: is a game based on the sport of basketball for boys and girls (co-ed) who are IN GRADE THREE OR FOUR in the season of play. The teams play cross court and the coaches referee their own games. Registration done through your local community association. Mini Basketball: is a game based on the sport of basketball for boys and girls who are IN GRADE FIVE OR SIX in the season of play. The teams play cross court and referees are provided. Mini A Pool teams play full court. Registration done through your local community association. Bantam Basketball: is a game based on the sport of basketball for boys and girls who are IN GRADE SEVEN OR EIGHT in the season of play. No player in high school can play bantam ball. Teams play full court and referees are provided. Registration done through your local community association. Midget Basketball: is a game based on the sport of basketball for boys and girls who are IN GRADE NINE OR TEN in the season of play. Players in this division may play even if they are on a high school team. Teams play full court and referees are provided. Registration done through your local community association. Juvenile Basketball: is a game based on the sport of basketball for boys and girls who are under 19 years of age as of December 31 of the season in play or in GRADE 11 OR 12 (Players must be attending high school on a full time basis). Players in this division may play even if they are on a high school team. Teams play full court and referees are provided. Registration done through your local community association.